Shang Xi was a Ming dynasty court painter who served during the Xuande reign (1426-1435). Awarded the honorary rank of Commander of the Imperial Bodyguard, he excelled at painting figural and narrative subjects. This hanging scroll is a type of auspicious subject to bless for long life, a traditional theme for birthdays. It depicts four immortals of Buddhist and Daoist origin (Li Tieguai, Liu Haichan, Hanshan, and Shide) together in the same work standing on waves. The four look up at the "Old Immortal of the South Pole," the God of Longevity, approaching on the back of a crane in the upper center. 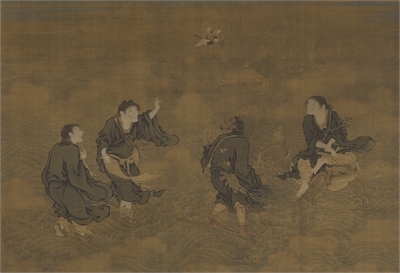 The use of brush and ink throughout the scroll is precise and delicate, the expressions of the figures harmonious and animated as if in conversation. The robe ends flutter in the wind, the brush lines angular and forcefully rendered. The waves, on the other hand, are outlined with trembling strokes that increase the magnitude of the subject. Having much of the decorative manner of Ming academic painting, the scroll also reveals a trend towards more popular themes in court art at the time.